Your next event should be the talk of the town, don’t you agree? Then Event Essentials of Huntsville, AL is the place to go. 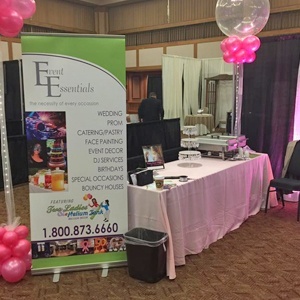 They make it easy with all of your planning and party services under one roof. Amaze your guests with one-of-a-kind balloon designs by Two Ladies and A Helium Tank. Let them taste savory cuisines from Event Essential’s exclusive chef, plus cakes and deserts from their personal pastry chef. The most important part: the music! Event Essentials also offers DJ services to keep your guests partying all night long! Having a specialty in every occasion, Event Essentials recognizes the importance of party planning and event decor for your special celebrations. We have made it our top priority to help dress your event through all of our services with wonderful unique products. No matter what the occasion, no matter what your style, or the event, our talented staff will bring your most desired vision to life!